Rocky Top Sports World hosted more than 190 events on site, including 61 multi-day events in both traditional and non-traditional sports. Rocky Top Sports World in Gatlinburg, Tennessee, continues to draw a crowd as it welcomed more than 120,000 athletes and spectators in its fourth year of operation. The venue, managed by The Sports Facilities Management, was responsible for $45.7 million in economic impact for Gatlinburg and Sevier County in the 2017-18 fiscal year. This accounts for a $6.6 million (17 percent) increase over original projections. “Rocky Top Sports World has surpassed all expectations and is a vital part of Gatlinburg’s economic growth,” said Gatlinburg Mayor Mike Werner. The facility hosted more than 190 events on site, including 61 multi-day events in both traditional and non-traditional sports. Rocky Top Sports World also held first-year tournaments produced by Junior Phenom Hoops, Girls Basketball Association, The Good Fight Martial Arts, and World Cube Association. “Any time you can see an immediate impact to your business from a group, it makes good sense. Rocky Top Sports World was a great investment in our community and businesses will be reaping the benefits for many years to come. These participants come to play at Rocky Top, but many come back at another time to visit for vacation,” said Greystone Lodge on the River General Manager and Rocky Top Sports World Sport Advisory Committee Member Jackie Leatherwood. 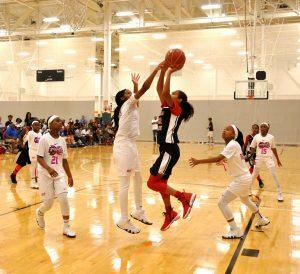 Rocky Top Sports World was also awarded the 2019 and 2020 hosting rights for the AAU 5th Grade Girls Basketball National Championships. Rocky Top Sports World is an 80-acre indoor/outdoor sports complex located in the heart of the Great Smoky Mountains offering world-class hardwood courts and state-of-the-art turf fields. For more information on the venue, facility rentals, or event information, visit www.RockyTopSportsWorld.com or call 865.325.0044.